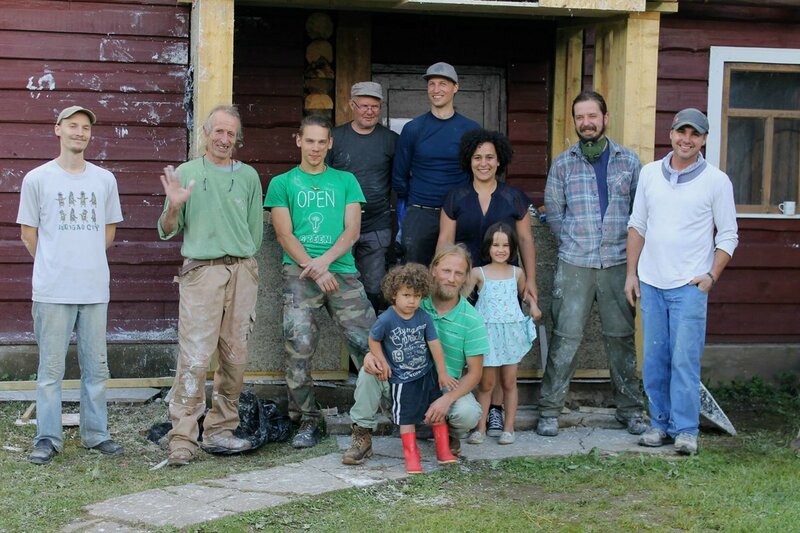 Last year, we had a unique opportunity to learn how to build with hemp from the hemp builder expert, Steve Allin. The project took place on our farm and it was designed to give participants a hands-on experience in the basic building processes. We learn how to mix the building material using the correct measurements, filling the frames that we build previously with the mixture (hemp, water, and lime), create the tapping tool and how to tap the mixture correctly and finally we learn how to plaster the walls. Before the project, Andris build the frames since we already knew what we wanted. The main idea was to renovate our house porch so we could have a functional structure. At this stage, we decided that we wanted the frame to be visible but it's entirely up to the builder if he wants to have a visible or "invisible" frame. In regards to the materials, we use to build the porch the list is not extensive since besides the mixer, wooden frames and plywood we only needed water, hemp shives, and lime. This last substance should be used with care as it's harmful when in contact with the skin. For this reason, we used gloves and protecting masks because of the dust generated when mixing. Since our building structure was small, it didn't take us long to fill in the frames. The workload was divided in the following way: one to two participants were responsible for the mixer and bringing the mixture to other ones who were filling in the frame and tapping the mixture. When a section was filled with the mixture we took out the plywood that was holding the mixture and lift it up to continue the process. This needs to be repeated until all the wall is filled with the mixture. We only use one mixer considering the size of the structure, however, if you are planning to build something bigger is important that you have bigger mixers or a second one. While building we had rain showers that made the hemp walls to dry a bit slower. This needs to be taken into consideration when building with hemp. We didn't have the chance to finish our roof but we plan to do it this year. Still, we were lucky enough to use hemp plaster and decorate the wall with a figure. Edvinas, a participant from Lithuania made a wolf figure with respect to a wolf organization that he represents. After the course, we decided to cover the structure and put back the wood, the same as the rest of the house. But this is entirely up to you! You can cover the structure you build or leave it as it is. We get a bit addicted to this kind of experience and that's why we want to repeat it. So, this year, we will have another hemp building course here at the farm. We have loads of ideas we want to develop and we're sure we'll build amazing stuff. Additionally, having Kerht Reyer, the founder of HempToday as a guest will definitely be another unique opportunity to learn more about hemp industry.